I wrote two weeks ago about President Obama's new foray into intervention in Iraq, using airstrikes to weaken ISIS strongholds throughout the country. Vicky followed up with an excellent piece arguing that intervention was nothing new for Obama, and perhaps she's right. However, these airstrikes were arguably a bold move for a President more accustomed to surreptitious drone strikes and more covert action as opposed to this new, more broadened campaign. 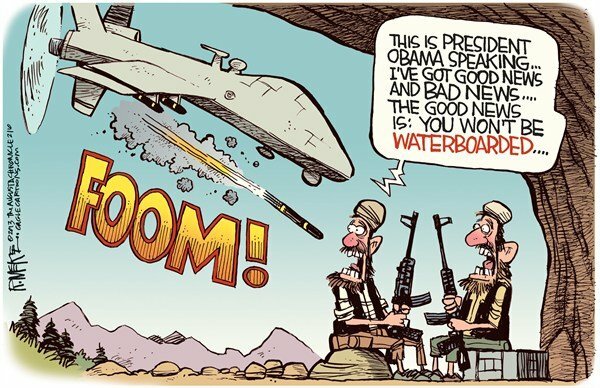 Surely Obama is beginning to step out of his comfort zone. The past two weeks have seen ISIS continue to use their disturbingly impressive PR prowess to dominate headlines both in the U.S. and abroad. Many continued the dialogue of exactly how much of a threat ISIS was, but most everyone agreed that they did pose a significant threat to the Western world. The Congress and Senate gave approval for the U.S. to begin deploying arms and military advisors to Syria in an attempt to equip and train the floundering rebel movement that has been fighting President Asad's troops, among others, for two years now. This was a striking decision - and not because of the complexity of equipping and training rebel militants in the worst warzone in the world. This decision was striking because of what it meant domestically: after an arduous few years of being deadlocked with the Republican-controlled House, President Obama was somehow able to get Congress to pass a bill, and rather quickly. The fear that ISIS has brought to America's doorstep has lead to lawmakers and the American people alike to rally behind Obama, and support him in his efforts to combat these Islamic radicals. As a recent Pew Research poll noted, the majority of Americans now think that President Obama must be "tougher" in his foreign policy - a figure that would have been impossible to believe as he assumed the Presidency in 2008. Early this week, President Obama took one step further outside of his comfort zone with similar airstrikes targeting ISIS territory in Syria, as well as renewed strikes in Iraq. This came after reports about some new, even scarier terrorist organization hiding out in Syria, that posed an even graver threat to American interests: Khorasan. Somehow able to have remained incognito until now, Khorasan is a group of former al Qaeda members that, like al Qaeda, have specific interest in attacks against America and Western Europe. As many experts have noted, unlike al Qaeda, ISIS is interested primarily in carving out their own territory and establishing a theocracy in which they can subject their people to strict Sharia law. Sure, disruptions to this plan such as American airstrikes will draw ire and could present ugly repercussions for America, but they are no al Qaeda in the sense that they exist solely to promulgate anti-American ideology and harm as many Westerners as possible in frightening, grandiose attacks. President Obama's airstrikes in Syria were a direct response to Khorasan, and it was reported shortly after the strikes began that the U.S. had thwarted an "imminent" plot to harm Americans. Interestingly, the strikes came as Obama took the stage at the United Nations General Assembly this week, where on Wednesday he talked about the threat terrorist organizations like ISIS and Khorasan pose not just to the West, but to the entire world. He made a point of emphasizing the coalition of Middle Eastern countries he had rapidly assembled to carry out the strikes in Syria, and called on an even broader coalition to support even broader efforts to deter these groups in the future. Notably, when President Obama took the stage at the General Assembly last year this time, it was following his decision not to call for airstrikes in Syria, despite President Asad having crossed Obama's "red line" and using chemical weapons on his people. The changes from Obama's candor then and today is truly striking. What comes next is anyone's guess. ISIS has shown no signs of slowing down, despite increased airstrikes today and new targets of oil fields they control, which keep them flush with cash. The Iraqi Prime Minister alluded to plotted attacks on American and European subway systems by terrorists in his speech before the General Assembly today, causing an immediate panic despite the fact that his words were difficult to immediately corroborate. And many analysts have expressed skepticism of the broad airstrikes against ISIS in Syria, as this can potentially strengthen Asad's army and terrorist groups such as Khorasan, who along with fighting the rebels, have also opposed ISIS' rise. For now, the strikes will continue, and it appears Obama has substantial support in his efforts. Let's just hope next week isn't as crazy. My colleague Colin Wolfgang recently wrote about Pres. Obama’s speech last Wednesday, in which the president announced that US airstrikes would extend from Iraq into Syria to combat the growing threat of the terrorist group ISIS(/IS/ISIL/who-cares-what-they-call-themselves-they’re-nuts). While many, including Mr. Wolfgang, point to the speech as a turning point in the Obama administration away from isolationism, it in fact continues the Obama White House foreign policy that has been in place since he took office: namely, Pres. 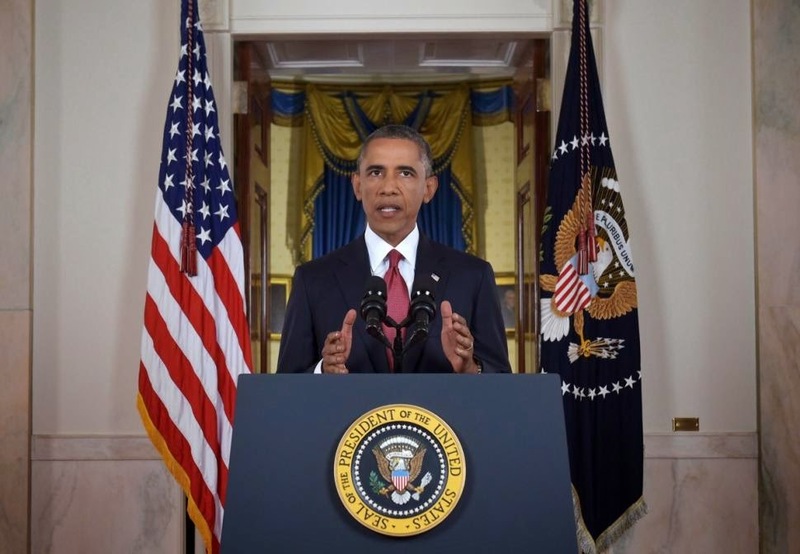 Obama’s policy of small- to medium-scale military intervention by another name. Whether you call it “police action,” “counterterrorism,” “targeted airstrikes,” or any of the other Obama administration euphemisms, this White House has pursued interventionist tactics in almost every global hotspot where it has encountered national security threats. The supposed difference from the George W. Bush administration has been the absence of “boots on the ground,” despite the fact that there will now be nearly 2,000 American “advisors” and who-knows-how-many special operations and CIA agents in Iraq. While large-scale military operations such as the Bush-era wars in Iraq and Afghanistan have been wound down, the United States is far from an isolationist nation. On Wednesday evening, President Obama spoke on the growing threat of ISIS (I still call it that; he calls it ISIL, or the Islamic State of Iraq and the Levant). During the event, Obama promised the degradation and eventual destruction of the terrorist organization, and promised more than 400 additional Americans to advise Iraq militarily. Although he mentioned that there was no credible threat directed towards the homeland at the moment, Obama acknowledged the severity of ISIS and warned that if not tempered, it could grow to eclipse the American public. Obama's announcement, and more profoundly, the past three months in general, have indicated that perhaps President Obama's legacy of non-intervention is about to come to an end. As a presidential candidate in 2008, Obama promised the removal of troops from both Afghanistan and Iraq. Those wars cost the United States more than a trillion dollars, and exacerbated the economic downturn the U.S. suffered just as Obama was coming into office. More importantly, they claimed American lives - thousands of them. With al Qaeda on its heels, it was time to rethink the way the U.S. fought terrorism and, more importantly, projected itself on the world. Ukraine: After nearly a year since protests erupted in Kiev, the country has been fractured, most notably by Russia's seizure of Crimea. Recently, pro-Russian separatists downed a commercial airliner with anti-aircraft weaponry, killing all on board. Today, the battles rage over the eastern part of the country, where the separatists have dug in their heels and refuse to back down. Syria/Iraq: ISIS has taken over vast swaths of land in a frighteningly efficient manner. Their recruitment efforts are effective enough that it appears numerous men and women from the Western world are joining their cause. ISIS has dominated headlines for the past several weeks, but their most powerful headlines were those relating to their gruesome and inhumane executions of two American journalists - both of which they leaked videos of. Africa: My colleague Vieshnavi has done a stellar job of detailing the malaise of Africa in her recent pieces (seriously, go check them out! ), so in order to avoid doing her work injustice I will keep it succinct: al Qaeda offshoots and other similar terrorist organizations have seen Africa as the next frontier. Countries like Nigeria and Somalia have experienced an influx in killings associated with Islamic militant cells. The instability associated with this has been stewing on the continent and will only grow more severe if not better tempered. These are just three examples - across the globe, there are issues at play that threaten President Obama's non-intervention strategy. The question is not so much that such issues have arisen, but how much Obama's avoidance of intervention over the years affected it. Sure, former President George Bush's wars in the Middle East were not the deterrence strategy the world needed, but the lack of appetite for warfare the U.S. has experienced since then has been equally unsuccessful in deterring aggressive acts from hostile nations. Therefore, in a sense, the move towards intervention in the Middle East now is a product of Obama's legacy of the last six years. The U.S. has sat idly by for the most part as more than 180,000 have been killed in Syria. Yes, there was a degree of U.S. support in Libya in 2011, but even that was muted. And while it's hard to see how the U.S. could have impacted the outcome, we were merely spectators during the Arab Spring, when we saw citizens across the Middle East rise up and challenge dictators - in several cases, successfully. Today, there is broadened support for increased U.S. military action. As I wrote in my last piece, much of this is derived directly from the miscalculation on the part of ISIS to broadcast the execution of two innocent American journalists, something that has emboldened the American public and restored the appetite for military justice. Obama has responded appropriately. Increased military strikes on ISIS targets will be an effective mechanism for uprooting the insurgency and, as Obama has said, "degrading" them. And training for Syrian rebels will hopefully bolster the effort to counter Asad's military. However, Obama's reputation of being somewhat of a figurative dove has decisively come to an end. The question now, is what effect the next several months will have on his lasting legacy. In the months since The Global Atlas last wrote about Boko Haram in Nigeria, the Sunni jihadist terrorist group has swept the countryside in full force, with leader Abubaker Shekau declaring an Islamic caliphate in Gwoza, Borno state. This is the second such caliphate to be declared after another jihadist group, Islamic State, similarly declared an Islamic caliphate in parts of Iraq and Syria. The extent of the territory claimed by Boko Haram remains in flux with a stronghold in Borno state, but Boko Haram is moving at an alarming pace in expanding the number of cities and towns under its control. Originally engaging in selective killings and guerrilla style hit-and-run attacks, Boko Haram has shifted gears, capturing and holding territory as part of the ‘Islamic caliphate’ as well as stepping up the degree of violence in its attacks, to the extent of essentially going on killing sprees in captured territory. The marked increase in violence has prompted an exodus of the civilian population in the twin cities of Gamboru and Ngala in northeastern Nigeria into neighboring Cameroon. Among those who have been killed were Gamboru’s highest Muslim cleric and the head of the traders’ union. In the past 24 hours, the son of Nigeria’s former President Olusegun Obasanjo has been injured, shot by militants in Baza as the Nigerian army battled to stop Boko Haram’s southward expansion and recapture key towns in Adamawa state. The Obasanjo family has a long-standing commitment to a united Nigeria, and Olusegun Obasanjo fought in the Nigerian military in the late 1960s civil war to prevent the southeast region of the country from seceding to form the new state of Biafra. Yesterday marked another tragic step in the story of the Islamic State, which has captivated news outlets as it expands its self-proclaimed caliphate in the Middle East and begins enforcing strict Sharia law on anyone within its control. 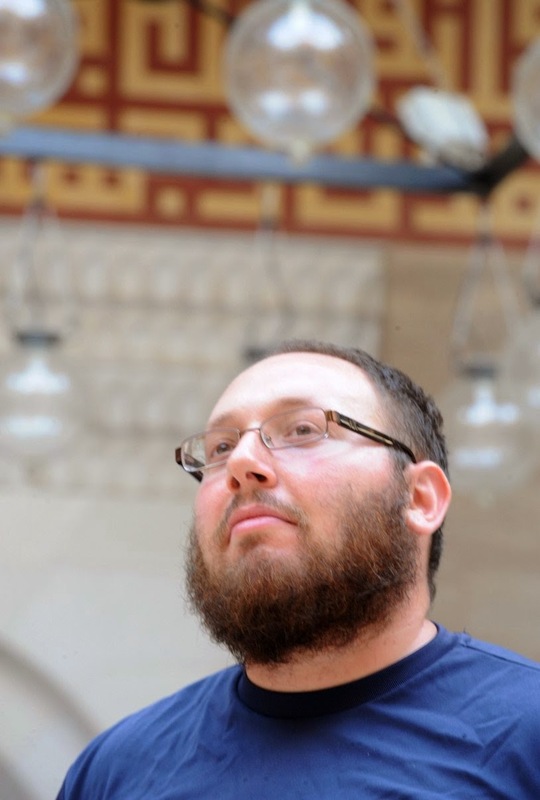 ISIS released a video, since confirmed by the U.S., of Stephen Sotloff, an American journalist, being beheaded. Like the first video, featuring James Foley, another American journalist, Sotloff criticized American foreign policy in the region and warned of the repercussions from ISIS in the future. Again, like the first video, another living hostage was presented, with another warning towards President Obama that any further American engagement in the region will be met with more beheadings. 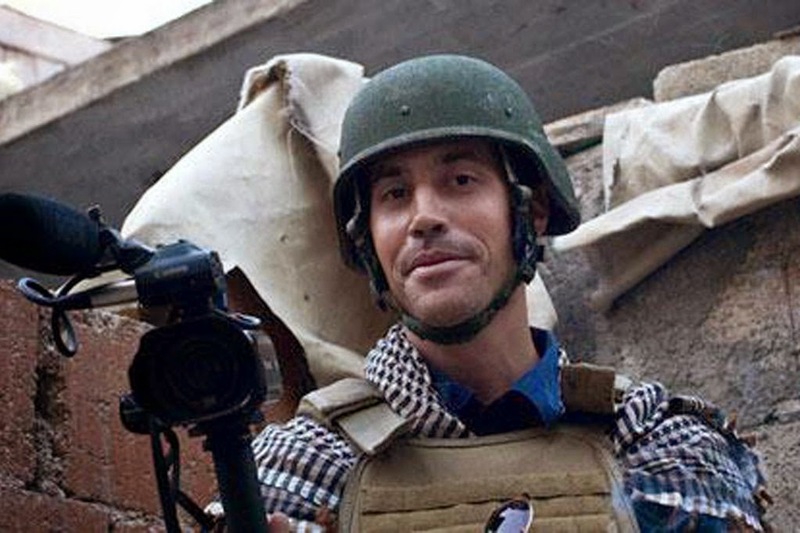 Foley and Sotloff are both courageous and will be remembered for their heroic foray into some of the most hellish places on Earth for the sake of reporting. Both videos were condemned by President Obama immediately upon confirmation, and were denounced by the entire Western world. And despite the fact that Obama vowed to continue airstrikes in Iraq against ISIS, they leaked Sotloff's video to the internet again. Why? The gruesome nature of execution videos has very rarely achieved any goals, for anyone. Wall Street Journal reporter Daniel Pearl's execution video in 2002 resulted in the majority of those directly involved in the killing being sentenced to death themselves or indefinitely held at Guantanamo Bay. Efforts against Al Qaeda in Pakistan and Afghanistan were substantially ramped up after the video became public, and it is not difficult to say that ultimately, nothing was accomplished by their inhuman execution of an innocent American. The release of these videos is not an attack on the United States government - at least not in the same sense as a suicide bombing is. Rather, it is intended to bore unpleasant images into the heads of the public, so they cannot escape what is happening abroad. It's intended to frighten civilians. These videos are a miscalculated attempt though, in the sense that the American public will view them as a personal attack - something that years of images of wartorn Syrian streets failed to accomplish - and will renew the fervor for action. In fact, it was shortly after the Foley video was released that President Obama publicly stated his contemplation for increased surveillance (and perhaps eventually military) engagement in Syria - something he wouldn't have dreamed of saying several months ago. ISIS has failed in their attempt to rattle the American public, and will only strengthen its solidarity and resolve to seek justice. One can only hope that no more innocent hostages have to die before ISIS understands this, and rethinks their scare tactic agenda.